A Swurl is a collection of users and the lists that those users are allowed to edit. 1. On the home page, click Manage swurls. 2. Click Create new swurl. • Name — Enter a name for the Swurl. Be as descriptive as possible; for example: Allow PR office access to social networking sites. • Description — Enter any other descriptive information about the Swurl that your organization might require. A Swurl consists of a one or more users. 1. On the Manage Swurls page, click on the Swurl you want to add the user to. • Name — Enter the user’s name and click Add. Tip: If you enter the first letter of the user’s name, Swurl will display all the users whose names start with that letter. 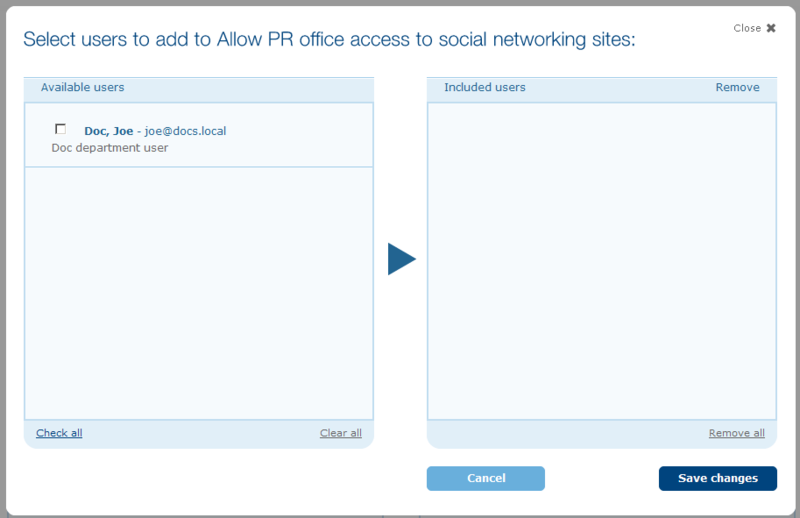 • Browse all users — Select the users you want to add and click the arrow to add them to Swurl. A Swurl also consists of lists of URLs. 1. On the Manage Swurls page, click on the Swurl you want to add the list to. Tip: If you enter the first letter of the list’s name, Swurl will display all the lists whose names start with that letter. • Browse all lists — Select the lists you want to add and click the arrow to add them to the Swurl. 1. 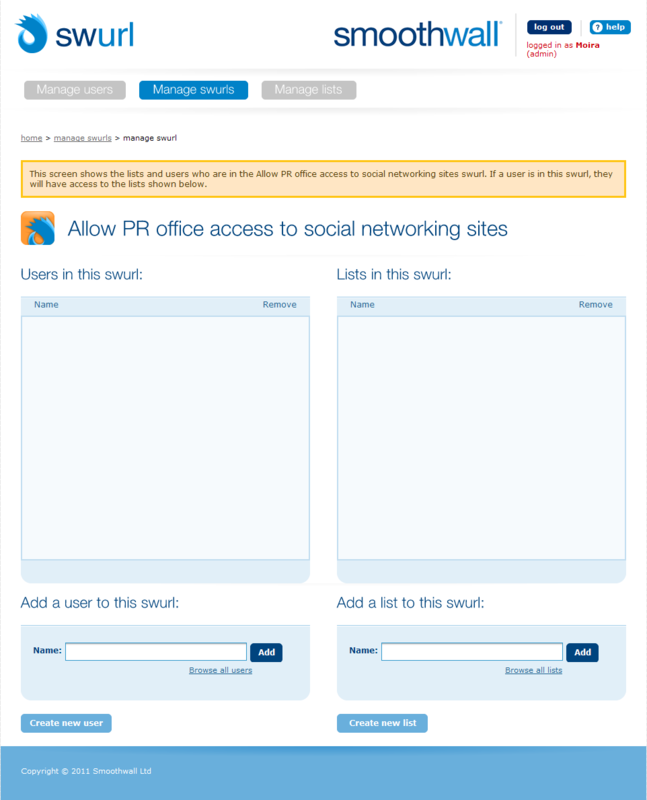 On the Manage Swurls page, click on the Swurl from which you want to delete the users or lists. 2. Locate the users or lists and click the adjacent Remove buttons. 1. On the Manage Swurls page, locate the Swurl you want to edit. Click its Edit button. Swurl displays the Swurl’s details. 2. Make the changes you require and click Save changes. 1. 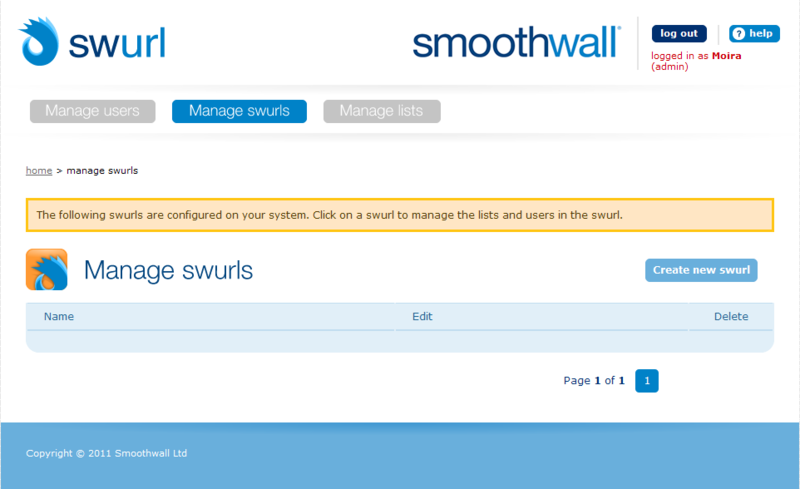 On the Manage Swurls page, locate the Swurl you want to delete. Note: The Swurl must be empty before you can delete it. For a detailed description of how to empty a Swurl, see Deleting Users and Lists from Swurls. 2. Click the Swurl’s Delete button.